Save Today at Pilot Flying J! Want to Save Even More On Fuel? you'll enjoy higher discounts with the convenience of a charge card. Table of Pilot Flying J RV Plus Charge Card Savings for each Good Sam Club membership tier. 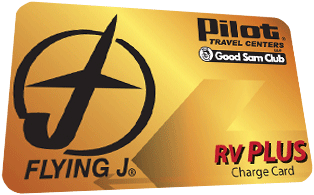 Questions about the Pilot Flying J RV Plus Charge Card? Discount available at company owned and operated Pilot Flying J locations. Offer void where prohibited by law.